The Liverpool Floating Receiving House was a Late Fee Office located on the Liverpool dockside. It was on wheels and could be moved to where the ship was moored ready to depart. 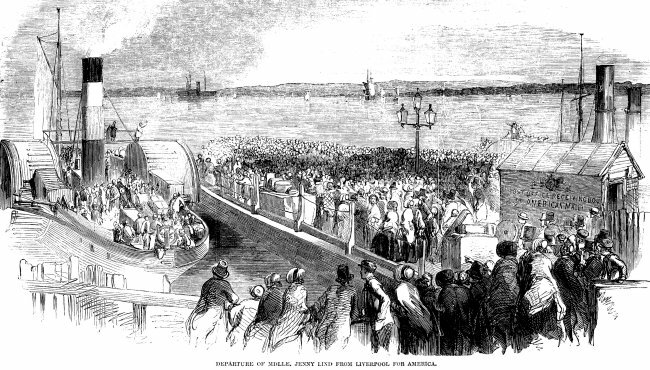 The picture above shows the FRH at the right hand side as a famous Musical Hall star of the period, Miss Jenny Lind, departs on the steam tender to join her ship (Collins Line's 'Atlantic') for the voyage to the United States. The legend on the side of the hut reads "POST OFFICE RECEIVING HOUSE / AMERICAN MAIL" below a Post Office crest. Source: Illustrated London News dated August 24, 1850, with an article about the departure of August 21st.